Día del Niño Verde will feature an innovative Pop-Up Adventure Playground created with recycled, reusable items. 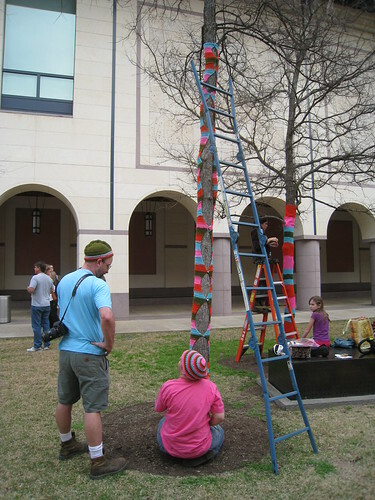 A Pop-Up Adventure Playground encourages children to create their own worlds out of everyday reusable items such as stacks of newspapers, tires, boxes, and ropes. While it may be hard to envision these materials as toys, children unfailingly turn them into something fun and imaginative and have a great time doing so. Other activities include bilingual workshops for all ages in environmental education topics, music demos by Semillitas de Español, children’s art and craft activities, our first MIS talent corner featuring student performances, local healthy food vendors, and a local Farmer’s Market with earth friendly products and services as well as fresh produce presented byGreen Gate Farms. Little Miss Recycle will host an electronic waste (e-Waste) drive to collect unused and disposable electronics and electronic parts that cannot be disposed of through standard methods of waste collection and recycling. The drive preserves finite resources, and prevents health hazards which often occur as a result of improper electronic waste disposal. Día del Niño Verde is being hosted by The Magellan International School which won the Green Ribbon School Award in 2011 and integrates green initiatives throughout its multi-cultural, multi-lingual curricula. The school strives to be a zero-waste campus and is co-hosting this annual event with Little Miss Recycle to inspire and educate the community. 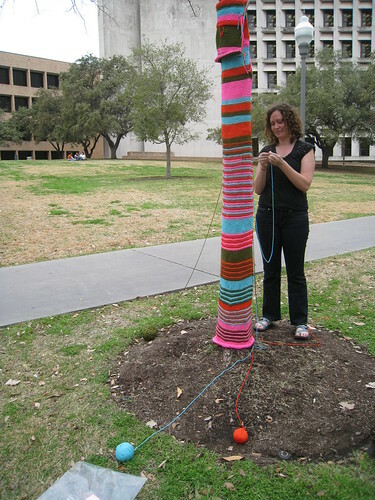 My plarn projects were featured in a recent Daily Texan article about local artists who reuse recycled materials in their crafts. The Daily Texan is the University of Texas student newspaper. Check it out! Last month, the City Council unanimously voted to pass the bag ban ordinance, which means single-use plastic or paper bags will no longer be offered at retail stores beginning next year. 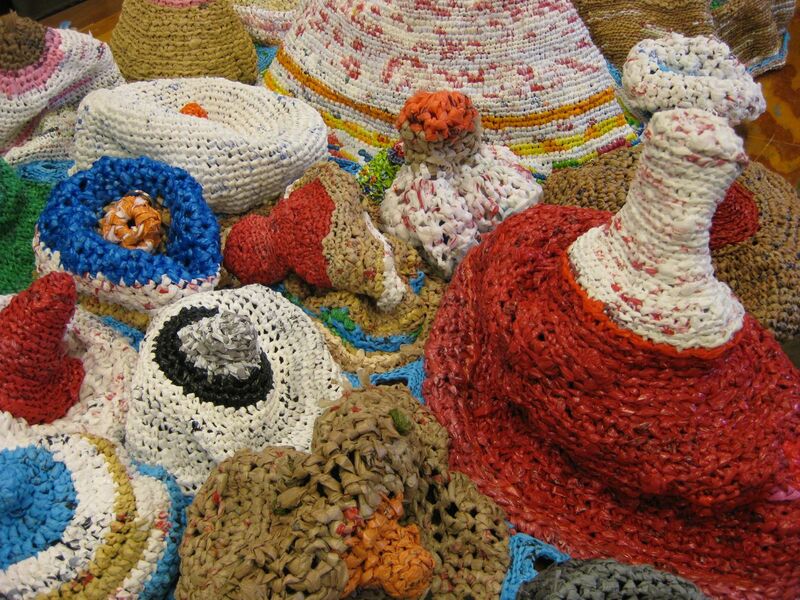 However, many local artists have decided to take a more creative approach by incorporating these recyclable materials into their art — from creating crafts out of recycled water bottles to crocheting with plastic yarn. Dean Wolf, radio-television-film alumnus of ’96, and his wife Carrie run Wolf Art Glass & Pottery, an online store which sells blown glass art, lighting and pottery created out of recycled materials. In particular, Wolf likes to work with Topo Chico bottles. Since they are made for machine production (and consequently to cool as quickly as possible), they provide for a more unique medium than the standard blowing “art glass,” which generally has a lower melting temperature and provides a longer work period for the artist. As glassblowing can often be a highly energy-consumptive art form, the couple is committed to finding ways of reducing their carbon footprint — for instance, they use a single furnace to melt down small batches of glass in a homemade clay crucible, which also allows for experimentation with various types of glasses. Wolf’s prior career was in coding and web marketing; so implementing Etsy, an online marketplace for handmade and vintage items, as the medium for their sales was a natural choice. 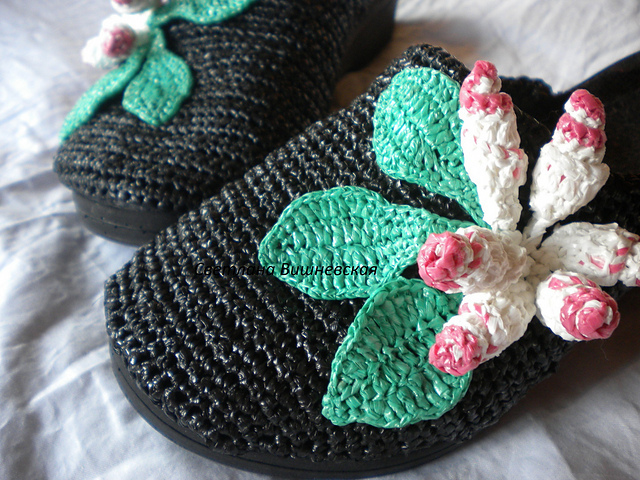 “We have tested other craft/artisan e-commerce platforms but always return our focus to Etsy as they have a proven history and the largest mass of online arts and crafts buyers,” Wolf said. 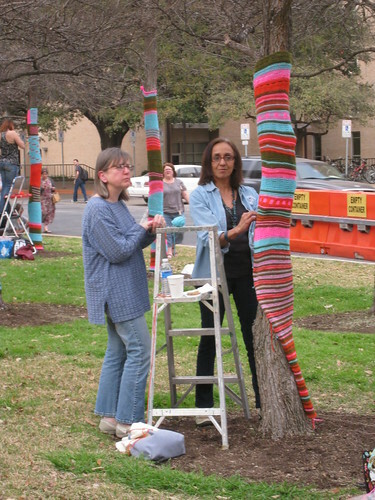 Cristen Andrews, Austin-based blogger of BagsBeGone.com, is another artist who blogs about her plastic bag crocheting and various other creations, many of which make use of recycled materials. 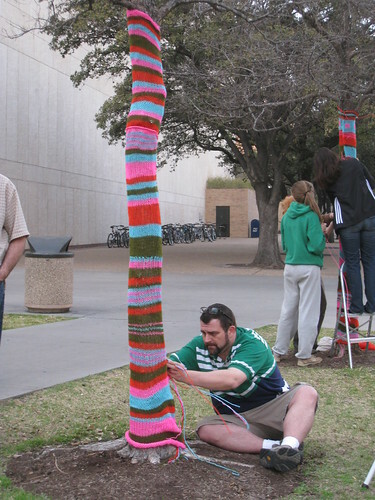 However, for Andrews, crocheting is more of a hobby than anything else. While she sells many of her creations at local craft fairs and shops, she primarily works as a freelance educational writer. 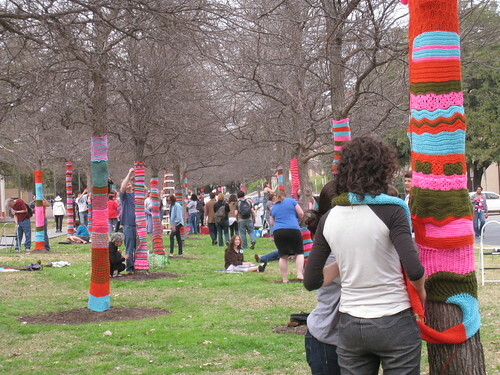 Andrews’s experience in blogging about “plarn,” plastic bag yarn, has led to the recent popularization of the practice. 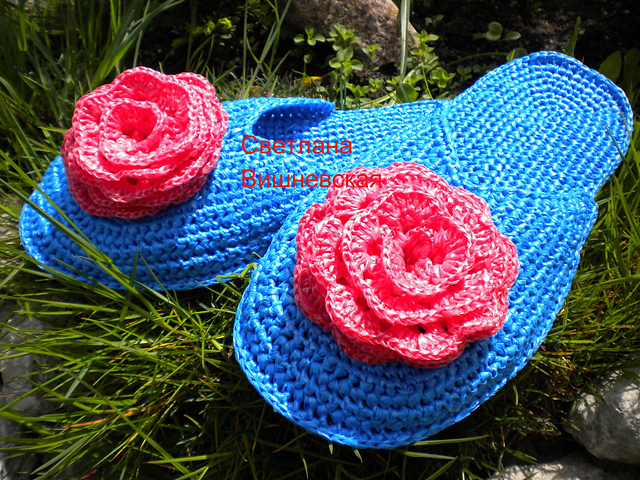 She currently receives daily emails from people around the world wanting to learn how to crochet from plastic bags or telling her about their own projects. 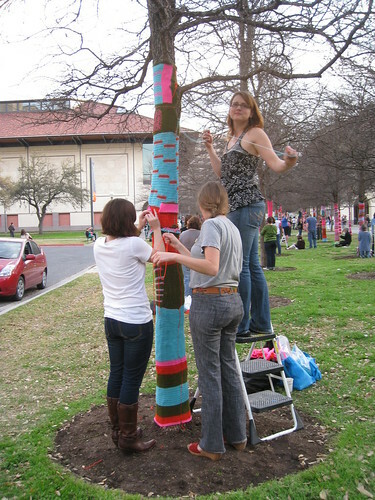 Over the past five years, Andrews has taught workshops to inspire others to recycle plastic bags in creative ways, at events like Make Magazine’s Maker Faire in 2007 and various workshops at environmental fairs and farmer’s markets in collaboration with Austin Green Art. Through a Kickstarter fundraiser and travel grant funded through Hostelling International, Andrews was able to spend the summer of 2010 traveling through Mumbai, Gujarat, Rajasthan and Delhi to spread her ideas of conservation through artistic means. However, even taking small steps to reduce wastefulness has proven beneficial for students regardless of artistic prowess. Government senior Shawn Johnson used recycled paint to decorate the walls of his apartment. 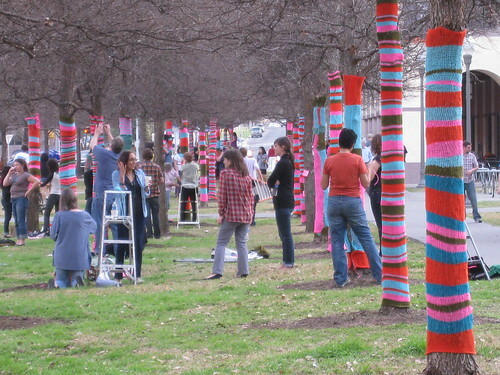 These creations also introduce a unique way of expressing environmental concerns through a platform not normally associated with these issues. 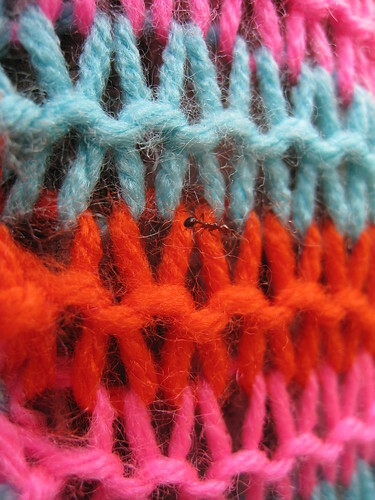 Sventlana Vishenka from Kaliningrad, Russia contacted me from Ravelry. 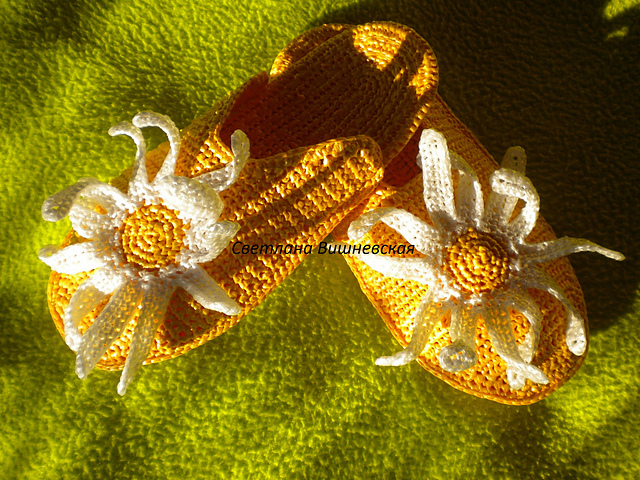 She crochets and knits with plastic bags – making creations like handbags, hats, rugs, flowers, and slippers. 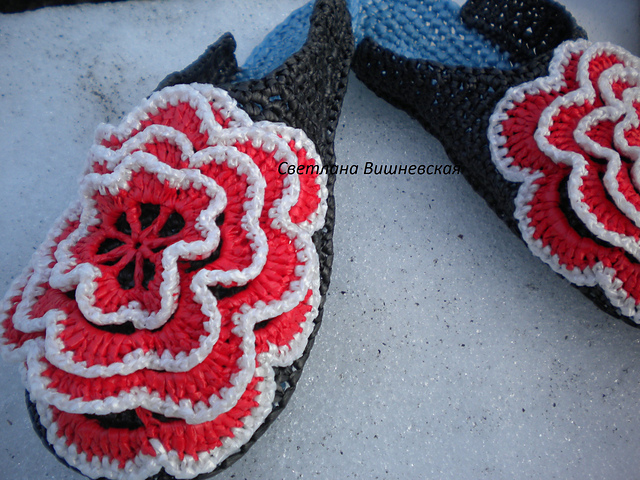 Check out some of these beautiful slippers she makes! 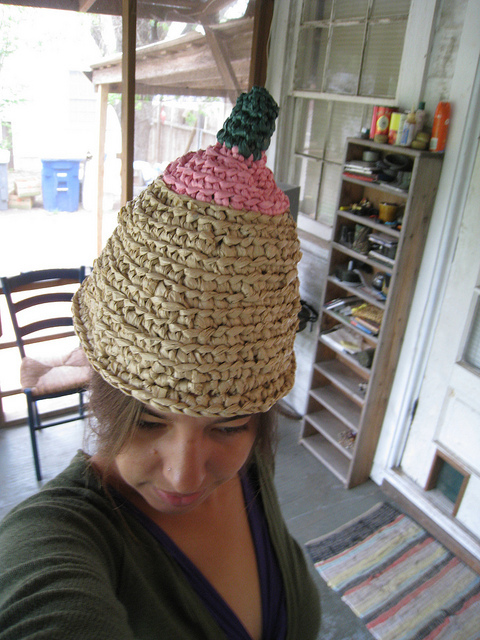 She makes some amazing things that are more intricate than anything I’ve ever made from plarn. So inspiring! 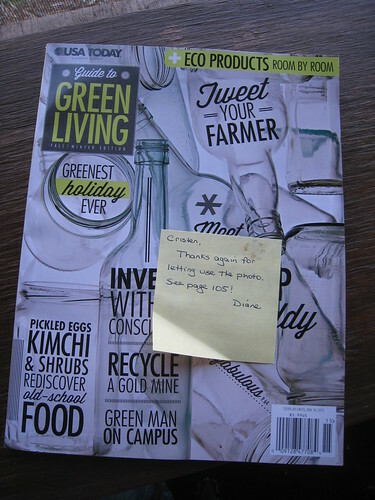 One of my photos was featured in an article about plarn in USA Today’s Guide To Green Living magazine. Check it out! 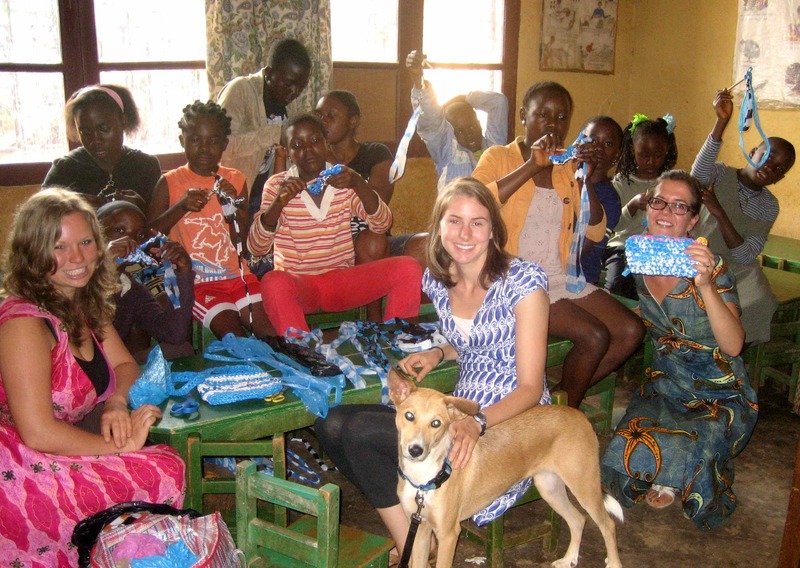 Cristina Kowarick is working with the Peace Corps and has been in rural Cameroon since the summer of 2010. Near the start of her time there, she contacted me saying she was trying to think up income generating activities for the local girls and women that would also be fun to do. 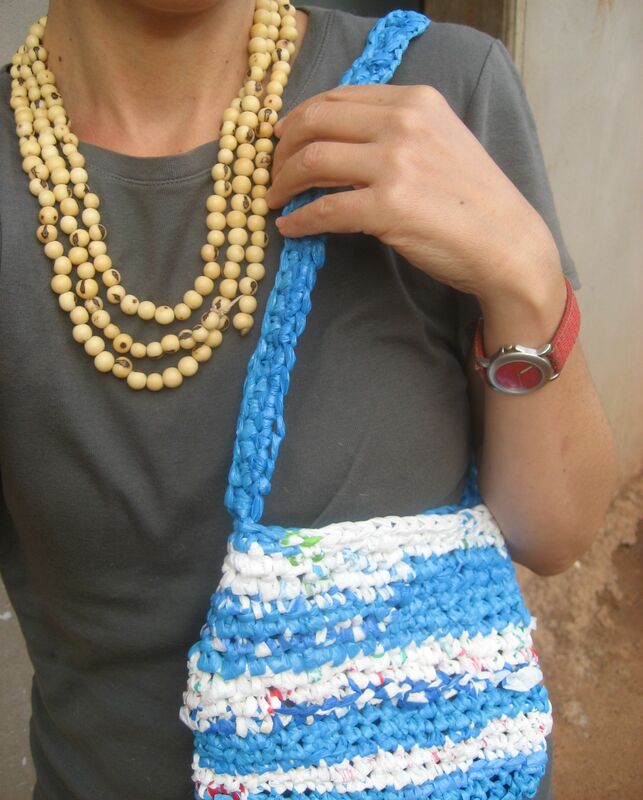 After creating her first crocheted bag (pictured below), Kowarick was motivated to take the project to the next level and teach the handicraft to others. Another Peace Corps volunteer, Rachael Saler, initiated a similar project in the Phillipines with great success (See: Peace Corps Volunteer in the Phillipines Turns Recycled Bags into Purses). And seeing how Saler’s project was so well received by the local community, Kowarick garnered even more inspiration to initiate something similar in Cameroon. 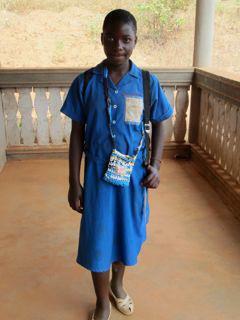 I enjoy getting updates from Kowarick about her projects there and am excited to hear more about her progress. 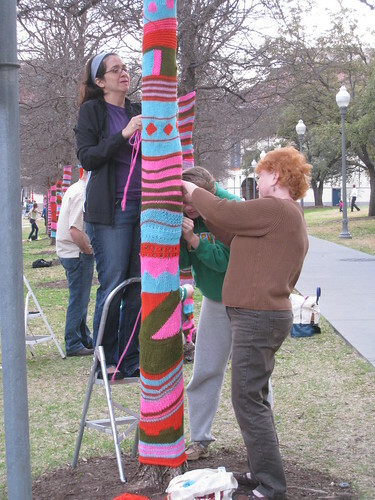 She commissioned a local artist to craft large wooden hooks, started a small crochet group with some neighborhood girls near her home, and has been teaching plarn workshops at various environmental camps in the village. 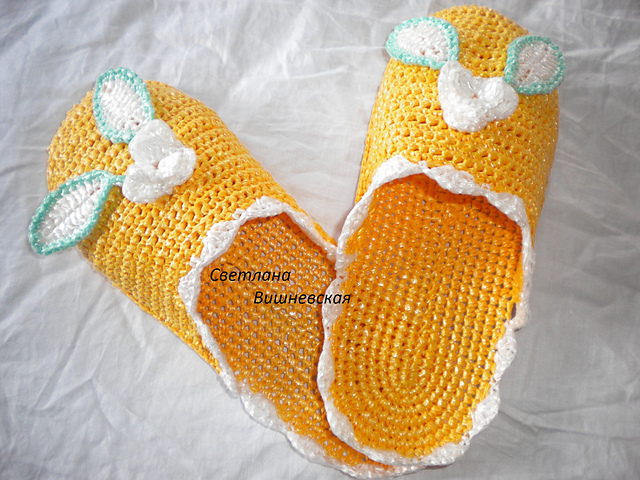 More recently, she taught some kids in an orphanage how to crochet plarn into pencil holders. They loved it! 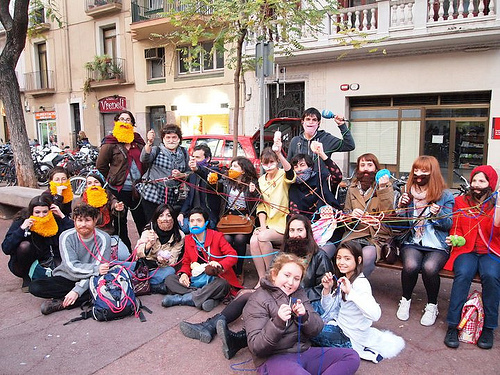 Kowarick guesses she has taught plastic bag crochet to more than 100 kids so far. Here is a photo she sent me with one of her neighbors modeling a crocheted plastic bag she made (complete with a hand-crafted plastic flower). 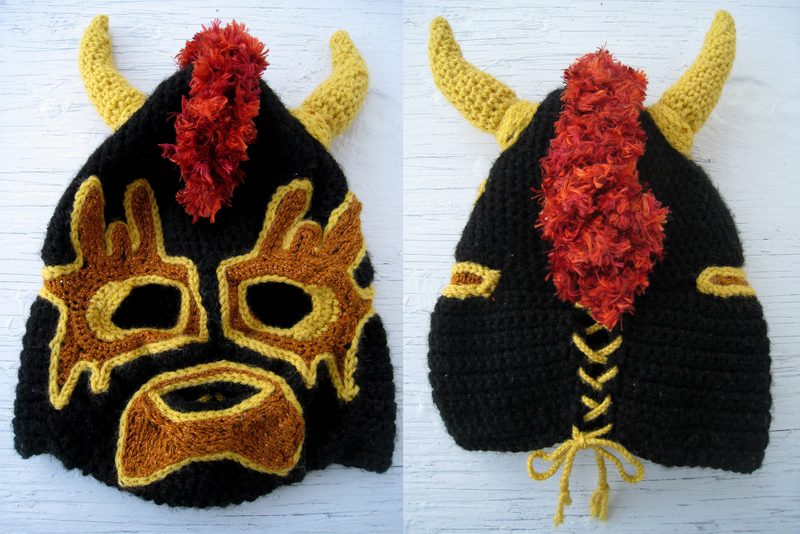 I crocheted this luchador costume a while ago, but just never got around to posting it. 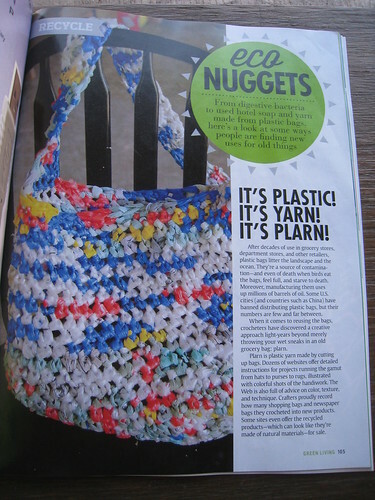 It’s not made from plastic bags, but I thought it would still be of interest to fellow crocheters. 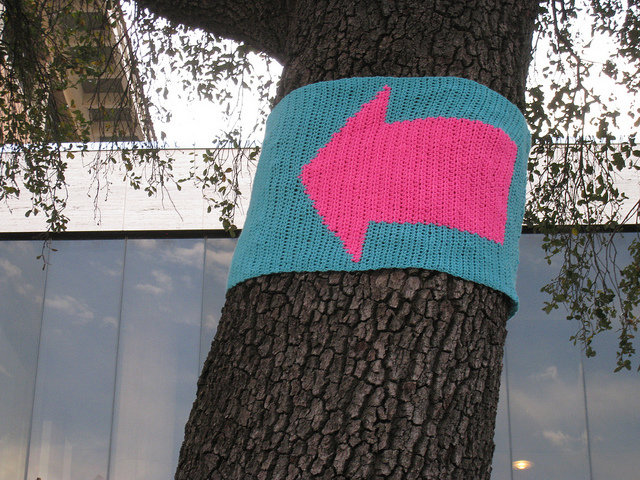 I actually made it for a Vanna White Contest last year (she apparently has her own brand of yarn). While it wasn’t selected as one of the winners, I’m still really glad I made it. I wore for Halloween this year and several friends have worn it for various costume parties. This Mexican wrestler costume can be worn by both men and women. Mexican wrestlers (or luchadores) have become iconic symbols of Mexican culture. Their outfits generally consist of simple color combinations so that the specific wrestler is easily distinguishable. While I created my own pattern and did not model it after a particular wrestler, I stuck with a similar style and transformed a few basic colors of yarn into an entire Mexican wrestler outfit. 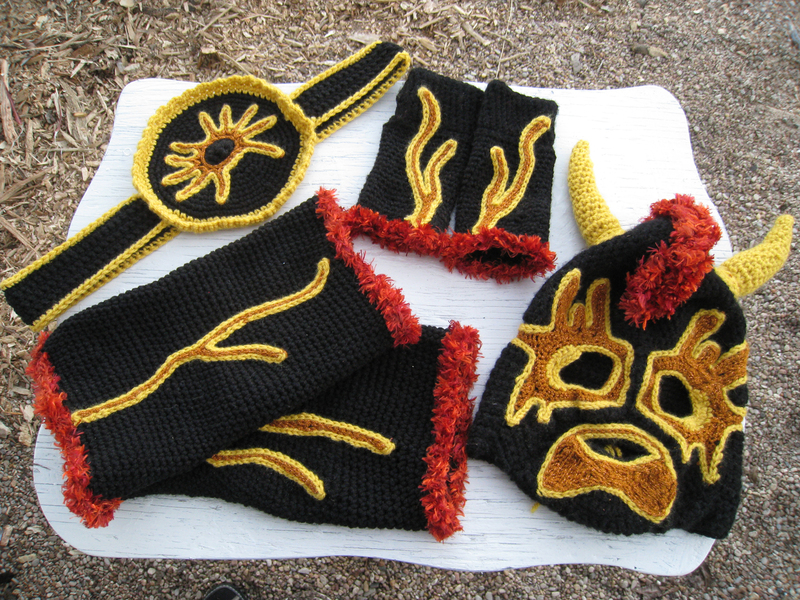 I constructed a belt, leg warmers, arm warmers, and a mask (complete with a mohawk and horns). Lucha libre, which translates literally as “Free Wrestling” has been popular in Mexico since the 1930s. You can learn more about it here. A friend sent me this and I think it’s pretty cool. 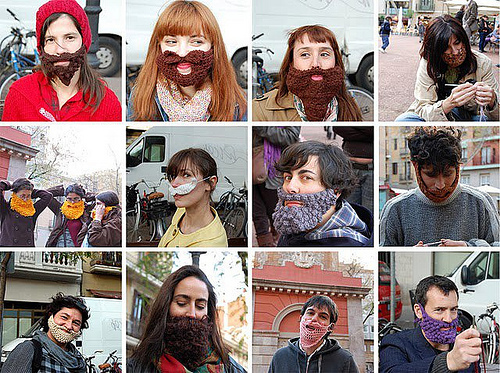 A group of guerilla crochet artists in Barcelona crocheted beards, roped themselves into a little spot, and held a demonstration on the streets about the lack of men doing crafts. Here’s a site (in Spanish) detailing the project. So it turns out that someone saw the demonstration, decided to have them entered into a street art competition. Here is an album of them at the competition. They got 2nd place and received a giant check for 2,500 euro. 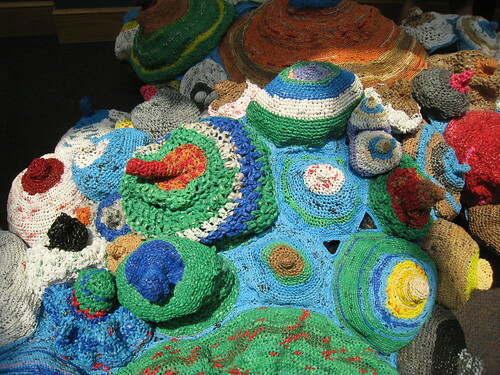 When I crocheted a breast for the Something in the Water exhibit, I didn’t think I’d actually get to see it. But I recently flew up to Pittsburgh to help my grandma move, so off I went to the Jewish Museum to check out the exhibit. 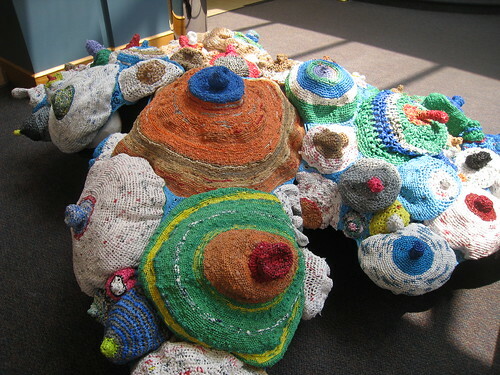 It was pretty cool to see the final creation of all the breasts sewn together! 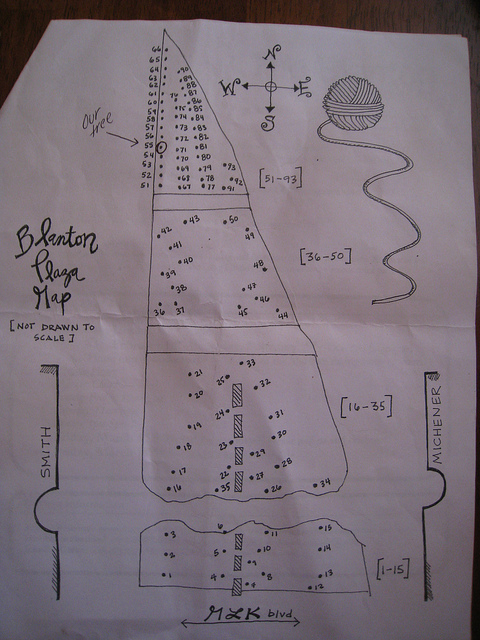 Next to the reef of breasts, there was a map showing where all the participants in the project are from. 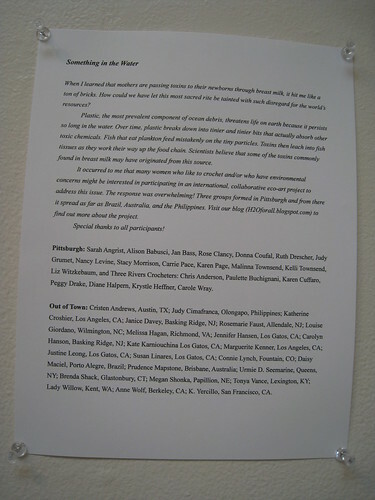 Most are from the US, but there were also breasts sent from Australia, Brazil, and the Philippines. Can you find me? 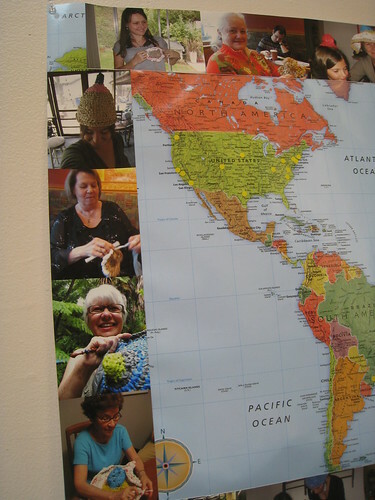 I’m the only one from Austin, TX and there’s a photo of me wearing my crocheted breast as a hat. When I learned that mothers are passing toxins to their newborns through breast milk, it hit me like a ton of bricks. How could we have let this most sacred rite be tainted with such disregard for the world’s resources? Plastic, the most prevalent component of ocean debris, threatens life on earth because it persists so long in the water. Over time, plastic breaks down into tinier and tinier bits that actually absorb other toxic chemicals. Fish that eat plankton feed mistakenly on these particles. Toxins then leach into fish tissues as they work their way up the food chain. Scientists believe that some of the toxins commonly found in breast milk may have originated from this source. 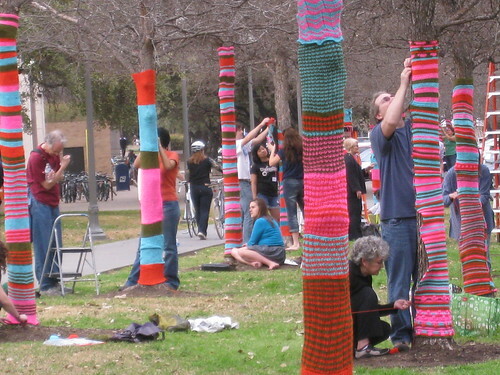 It occurred to me that many women who like to crochet and/or who have environmental concerns might be interested in participating in an international, collaborative eco-art project to address this issue. The response was overwhelming! Three groups formed in Pittsburgh and from there it spread as far as Brazil, Australia, and the Philippines. Visit our blog (H20forall.blogspot.com) to find out more about the project. Tonight is the opening night for the Something In the Water exhibit I collaborated on (referred to in a previous post – here). Here is the email I sent out to local people. Tonight is the opening. Wish you all could be here. 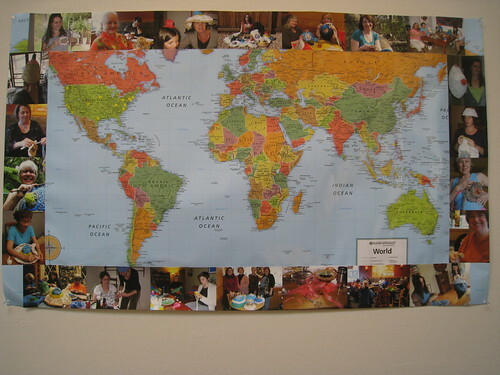 I have your photos posted with a world map indicating where everyone lives as well as all your names and locations on the collaborator list. 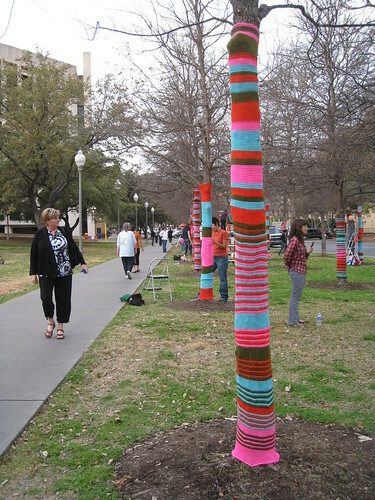 I will send some photos of the installation soon. After 30 people hrs trying to install the piece on a genie lift, we had to reinvent the installation and float it just off the ground. We were not going to be able to complete it before the deadline when it was hanging from the 30′ ceiling. But it looks really great. Thank you all! 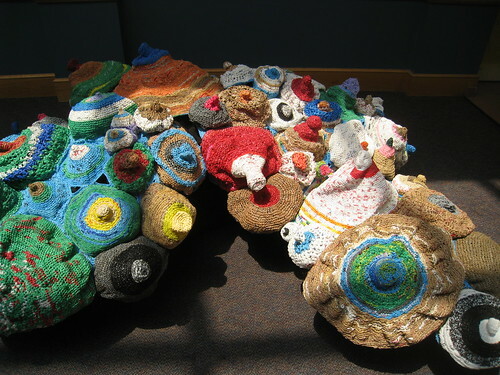 Maybe my most ambitious project to date, Something in the Water, a collaboration with women across the country and abroad who crocheted breast shapes from plastic bags, is on view for the first time Saturday evening. Please join us! 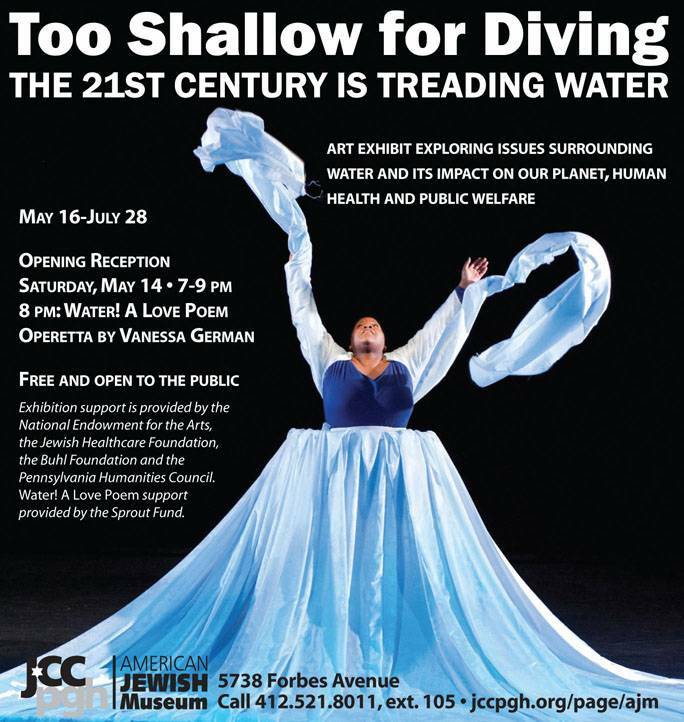 Don’t miss this opportunity to see how fifteen artists’ face water issues in their own ways in. Too Shallow For Diving/The 21st Century is Treading Water. This is my first experience with the wonders of a viral project on the internet. 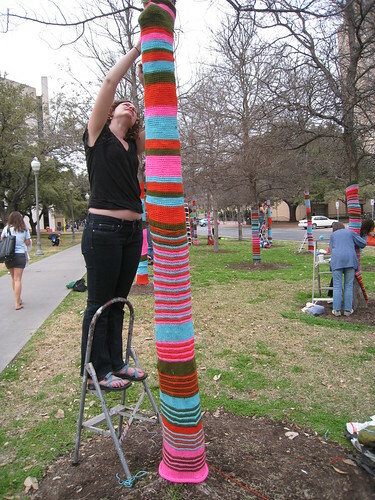 OPENING SATURDAY, MAY 14TH, 7 – 9 P.M.
CURATOR’S TALK: CAROLYN SPERANZA at 7:30 P.M. PERFORMANCE: VANESSA GERMAN at 8:00 P.M. 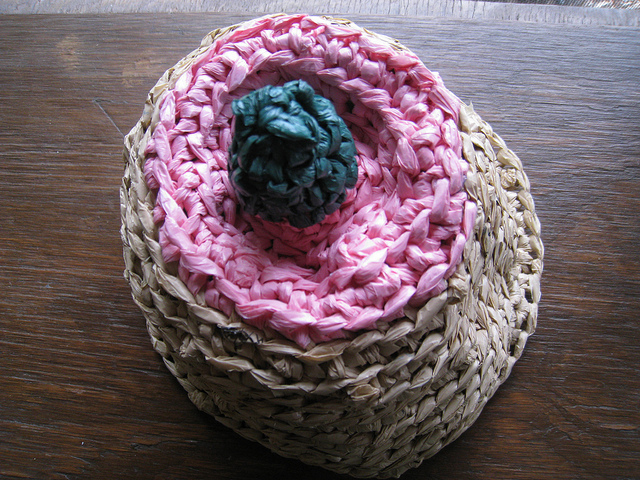 Here are some photos of the crocheted plastic bag breast I contributed. I think it looks more like a hat than a breast.